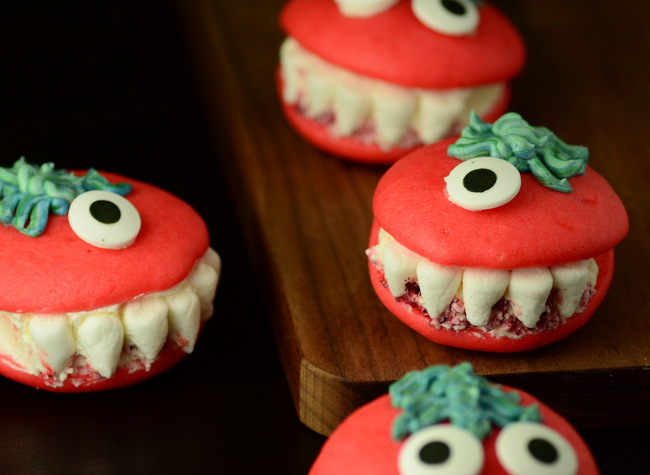 I always have a lot of fun making goodies for Halloween and theseÂ Halloween Monster Whoopie Pies are a great example of a creepy-yet-cute treat! 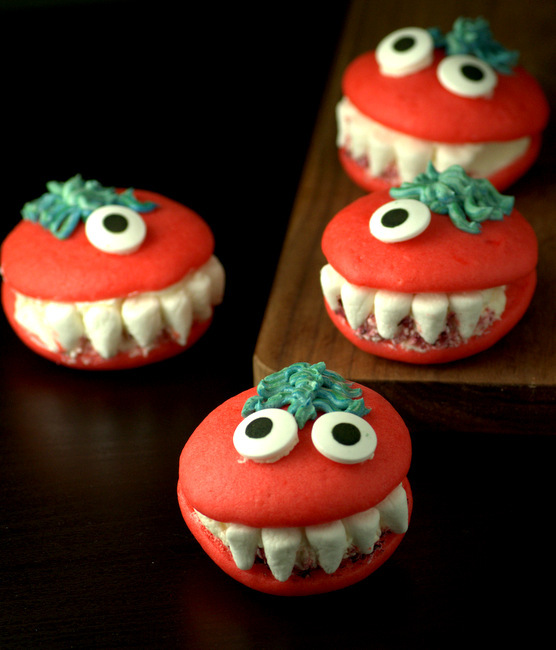 The monsters start out as colorful whoopie pies and are filled with vanilla buttercream. It’s a classic combination, but adding marshmallow teeth, candy eyes and a bunch of food coloring turns them in to a treat that is worthy of any Halloween party. The whoopie pies themselves are easy to make. The cake-like cookies are made from a batter that comes together quickly and bakes into nice, round discs. Try to make the dollops of batter as even as possible when transferring them from the mixing bowl to the baking sheet, as you’ll need to pair them up to make the pies. I opted to make mine pink-red to evoke a mouth and make the teeth stand out as much as possible. The teeth on these little guys are made from mini marshmallows. Cut each marshmallow in half diagonally using a pair of kitchen shears. The marshmallow will have a bit of a curl to it, and pressing the cut ends together will form a neat “fang”. You can also make fangs simply by squishing one end of a mini marshmallow together into a point, but I find that they are a little bit too large to work with easily. Big candy eyes and a swirl of crazy, colorful hair finish off these monsters, which end up looking like creatures that didn’t quite make the cut at Jim Henson’s workshop during muppet try-outs. The vanilla cake and vanilla marshmallow buttercream are a delicious combination that you simply can’t go wrong with, though you can add different extracts to both the cake batter and the filling to create your own flavor combination. The pies are generously sized to make room for the teeth, so this recipe doesn’t make a huge batch. Feel free to double it if you need to feed a hungry crowd! My whoopie pies are pink and have a blue-green swirl of “hair” on top of them for contrast, but that isn’t the only color combination you can use. Green monsters with blue hair, purple monsters with yellow hair and black monsters with red hair are just some of the many possibilities. You’re limited only by your imagination and what food colorings you have on hand. To make the marshmallow teeth stand out even more, you might want to add a splash of color to your buttercream filling. You can do this by dipping a toothpick into some food coloring and swirling it through the buttercream at the bottom of the sandwich, where the points of the teeth are. If you want to make them even creepier, try my edible fake bloodÂ as a finishing touch. In a medium bowl or a large measuring cup, whisk together milk, egg and vanilla extract until well-combined. Add buttermilk mixture to the dry ingredients and stir until no streaks of flour remain. Pour in melted butter all at once and stir until it is completely incorporated. Add in food coloring of choice and stir until completely incorporated. Drop two tablespoon portions of batter, making them as circular as possible, onto prepared baking sheet. You should have 16-18 individual cookies. Bake for 11-13 minutes, until cookies are set and spring back when lightly pressed. Allow cookies to cool on the baking sheet for 3-4 minutes, then transfer them to a wire rack to cool completely before decorating. Pair up the cake rounds with other rounds of similar size and shape. Place most of the buttercream (or other vanilla frosting) into a piping bag or ziploc bags with the corners snipped off. Transfer 3 tbsp buttercream into a small bowl and color with contrasting food coloring (for the hair). Transfer to a small piping bag or ziploc bag with a very small hole cut in the corner. Fill cake pairs with plain buttercream, making a thicker layer on on side (so the “mouth” is open). Finish each creature with 1, 2 or 3 candy eyes, sticking them on with a bit of buttercream. Add a squiggle of hair from the small piping bag filled with the contrasting color of frosting.